Being an official is an extremely important role in any sport. Without officials giving up their time, most sporting competitions would be unable to function. Officiating can be a challenging role, and unfortunately some officials are subjected to hostile behaviour by participants, spectators and others. Officials need to be able to perform their role in a positive manner, and block out the ‘nonsense’ that can be generated by spectators. Officials need to ensure their approach towards officiating is in line with the aims of the competition (for example, junior competitions are usually aimed at fun and skill development, rather than winning). Officials should be aware that their approach to officiating can influence the participants experience and enjoyment of the sport. Each official becomes the ‘face’ of officiating at competitions. People often judge all officials by how an individual official behaves, hence the need for professional and responsible approaches when dealing with participants, coaches, administrators and others involved with competitions. Some sporting organisations have a uniform which officials are expected to wear while officiating at sanctioned or formal competitions. It is important that officials present in a manner that portrays officiating in a positive, professional and respected manner. Officials undertake an important role in the staging of competitions. They provide leadership and guidance to participants in a facilitative manner, ensuring that the competition is conducted in a safe and fair manner. Qualities such as integrity, honesty, trustworthiness and respect are integral to the role of the official. This includes how they behave and relate to others prior to, during and following competition, how they present themself as an official and how they go about their role. Officials are responsible for their actions and attitude. People expect the official to be a person they can trust to control the competition. It is important that officials fulfil these expectations. By doing this, officials will earn the respect of participants, coaches, administrators and their officiating colleagues. It is important to remember that the competition in which the official is officiating is the most important competition that day to those participating in it. The physical requirements of an official will vary from sport to sport and within a sport. Some sports require officials to be very active - rugby league, basketball, netball; while others less so - equestrian, athletics, rowing. Adopting a healthy lifestyle will contribute to all officials being in appropriate physicalcondition. Officiating in some sports will require additional physical preparation that is appropriate for the particular sport. The more active officiating roles require a level of physical fitness that will allow the official to achieve correct positioning throughout the competition, make good decisions and officiate the competition in a non-distressed physical state. Cooperation between officials leads to a much smoother running of the competition and conveys to participants and others that the officials know what they are doing and are in control of the situation. Communication within the ‘team’ prior to, during and after the competition contributes to a sense of certainty for participants and others and reduces the risk of confusion during the competition. Sharing of information between officials can add to the accuracy of official’s decisions. From time to time, officials are unsighted and might ‘miss’ a decision if it weren’t for a colleague assisting them. Sharing of experiences within a team of officials can assist with the development of colleagues. Supporting each other, particularly through tough times when the environment can be daunting to the inexperienced official, can add strength to an official’s team. Depending on the competition, there could be a range of officiating roles that are undertaken to stage the competition. For example, at a swimming meet there is a starter, timers, referee, and recorders. Officials need to cooperate with colleagues for the successful staging of the competition. Each official is reliant on the other. It is important that each is aware of the different roles and the requirements of each official’s role. 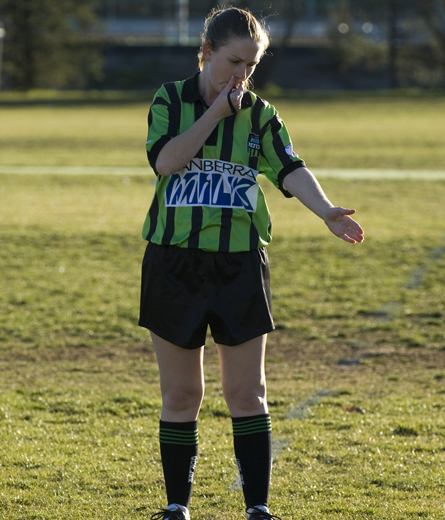 Communicating and co-operating are two key ingredients which contribute to effective officiating. Spectators and others frequently disagree with official’s decisions, and from time to time, decisions will infuriate spectators and others to the point where they can become hostile towards the official. This situation can be minimised by the approach the official takes to those situations. It is important that the official does not engage with the spectators eg. no eye contact or verbal response, as this can further incite the aggrieved spectator. Never respond to spectator abuse, (much as you might like to!). Seeking the official’s attention and distracting them is one of the aims of an abusive spectator.